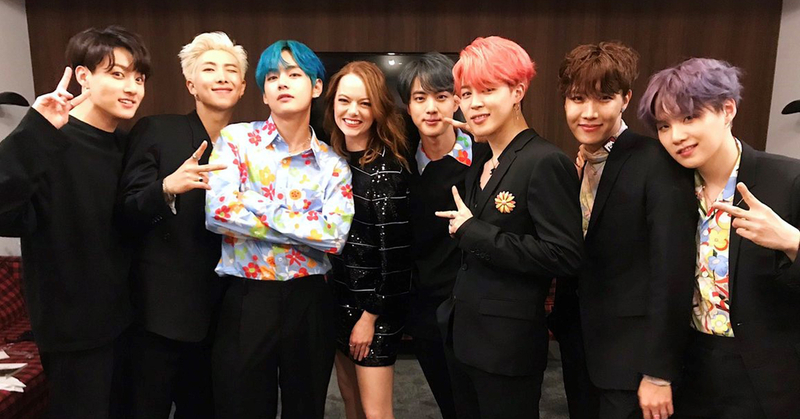 Who could possibly resist a hug from BTS after their powerful live performance at SNL? We certainly know that Emma Stone couldn’t. Here’s a clip of Emma Stone giving BTS’s member, RM, a friendly hug after their performance. And for once, we’re jealous of Emma not because of her flawless looks or her amazing talent but simply because she got to hug RM. Emma stone has on numerous occasions stated that she is a true K-pop fan. So it would be safe to assume her wide grin in the group photo with the BTS members is a genuine reflection of her happy state of mind. Here’s another clip of an SNL crew member not missing out on an opportunity to hug a BTS member. After their successful live performance, members were giving out encouraging hugs to one another. As Jimin reached out for Jungkook for a hug, an SNL crew member budded in between them and took the hug for himself. The way he points to himself and enthusiastically asks ‘ME?’, as if to ask if the hug was meant for him, is all of us. Because, really, who isn’t eager to fall into the arms of Jimin.